Arthroscopic shoulder surgery is one of the many procedures available to Reno, Nevada, area residents at Tahoe Fracture & Orthopedic Medical Clinic. Because this procedure requires a much smaller incision than that used in open shoulder surgery, it offers many benefits as compared to traditional procedures, including less pain and stiffness, a lower risk of wound complications, a shorter hospital stay, and less recovery time. 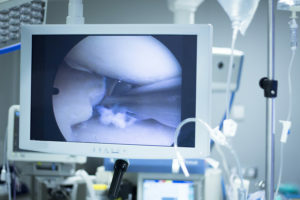 During a minimally invasive procedure, we begin by making a small incision in the shoulder joint, through which we then insert a small camera (the arthroscope). The camera is connected to a large video monitor, providing us with the closeup view that we need in order to make any necessary repairs using miniature surgical instruments. Even in cases where surgery is not necessary, we often use arthroscopy to inspect the shoulder and diagnose various shoulder conditions. If you’ve attempted to treat your shoulder condition using nonsurgical methods with no success and are interested in finding out whether arthroscopic shoulder surgery could potentially be used to relieve your pain, please call Tahoe Fracture & Orthopedic Medical Clinic today. We have various locations throughout the area, including one in Reno, NV, and we offer convenient scheduling and financing options. Our skilled multidisciplinary team includes physicians, surgeons, physical and occupational therapists, physician assistants, and nurse practitioners. Some of our professionals even specialize in arthroscopy, and are members of the Arthroscopy Association of North America. We look forward to helping you explore the various treatment options available to you.